Get 15% off the Photomatix program (reg. $99) just by entering “beforethecoffee” in the coupon code box of the Photomatix purchase page. It’s not unusual for a company to come out of the blocks in a full sprint and leave the competition in the dust. Look at Google, Ebay and the iPhone; they lead the industry in their categories and everyone else plays catch-up, When it comes to HDR software it’s Photomatix created by HDRsoft. Each new version of Photomatix incorporates new tools giving us more control over the final image and Version 4.0 is no disappointment. This Photomatix tutorial covers Version 4.0 and will take you through it’s most popular tone mapping tool, Details Enhancer. So let’s get started. In Bermuda I used a Nikon D2x with a fish eye lens and a tripod to capture the source image set of 5 images, each a different exposure: 0EV, -2EV, -1EV, +1EV and +2EV. 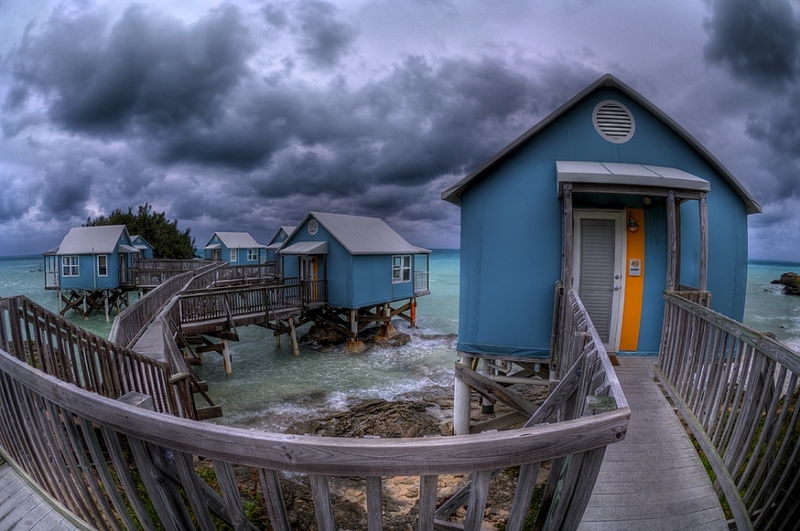 These beach huts are made of canvas and when you sleep at night you can hear the waves crash under your bed. Pretty cool place! Let’s jump ahead and see the final HDR image. If you take a moment and think about sunlit scenes you realize pixels in the shadow areas come from the overexposed images and pixels from the bright areas, like the sky, come from the underexposed images. These images are the building blocks of the final 32-bit HDR file. Once you install Photomatix, double click on the icon and a window opens with 3 choices. 1. Load Bracketed Photos – This is the place to BEGIN, it will require an image set which may be 3 or 5 images. 2. Batch Bracketed Photos – Batch processing is used when you shoot HDR image sets all day long and have about 50 images and you’d prefer to go get a bowl of ice cream while the processing is done. The advanced feature now allows different size image sets in the same folder, 3 or 5 for example. 3. Batch Single Photos – This will allow you to do single image tone mapping on a folder of selected images. If you prefer to tone map one image file go to File>Open. Tip: Batch processing is best when used to create 32-bit HDR files only. I avoid Batch processing that includes Tone mapping. Tone mapping adjustments are image specific so I prefer to apply adjustments to one image at a time. Notice here I clicked Load Bracketed Photos then Browse then selected 5 tif files then clicked Select. This image set consists of 5 images taken at 1EV spacing. RAW to Tif conversion? Notice that the images I’m about to load are TIF, however the camera was setup to record RAW files, should I convert my RAW files to TIF first? YES, the present thinking is to convert your RAW files to 16-bit TIF for better results. However, if I have lots of different compositions of the scene, I typically process and tonemap the RAW files, then I decide which composition is best, then I go back and convert the image sets to TIF. Save 32-bit HDR file? There is a check box that allows me to view and save the 32-bit HDR image. Why would I want to save the 32-bit HDR image? The 32-bit HDR file is an intermediary file, you don’t look at it or print it. Having this file on hand saves you a little time if you decide to tone map the image again with different settings. I normally don’t save this file. HDR formats? If I decide to save the 32-bit HDR file, what about the various formats? The default format is .HDR, the two others are .EXR and TIF (floating point tif) they come in handy for research and testing. I always accept the default .HDR and move on. Once you select your image set you are presented with this box. I recommend checking the “Align source images” as a routine setting. Keep the next 3 boxes unchecked for now, create a “Dry Run” tone mapped image, save it and inspect it for ghosting, noise and chromatic aberrations. If the problems are beyond what you want to repair in post processing then re-run the image set with the needed boxes checked and save it. This will allow you to compare the “corrected” image with the original. Reduce ghosting artifacts – most of my ghosting corrections take place manually during post-processing so I rarely check this box. In Photoshop, I create layers and blend one of the single exposures into the tone mapped image. Typically, I FIRST tone map the single image before I blend it into the tone mapped image for a similar look. Ghosting in your image? Who ya gonna call? The new ghost buster tool in v4.0 is much more sophisticated than previous releases so I recommend giving it a try. First chose the “Semi-manual” option. Then draw a selection around the ghosted area using the lasso tool, right click to select it, then right click again to set the photo you want as the source image, e.g. -2, -1, 0, +1, +2. Tip: Ghosting is the result of a moving object. When I use a single image to blend into the tone mapped image I like to use the -1 or -2EV exposure. Why? Because the shutter speed is faster thus the moving subject is sharper, but watch for noise. Reduce noise – v4.0 has high quality noise reduction with a new algorithm applied on the source images. Remember noise is part of your image at the time of capture as opposed to grain which is caused by excessive compression of the pixels, i.e. overly high strength settings. Reduce chromatic aberrations – results can vary when this box is checked. I like to have the the “Dry Run” image for comparison. A new window will open and now the fun begins….. The tone mapping portion of Photomatix can be considered the goose that laid the golden egg. The program has three tone mapping operators, Details Enhancer, Tone Compressor. and Exposure Fusion. Each is accessed as a drop down in the top left portion of the window. Images tone mapped using Details Enhancer (above) can be very surreal. Details Enhancer is by far the most popular tone mapping tool. However, if Details Enhancer is too much for your taste, then Tone Compressor is an excellent choice for maintaining a natural look. If shadows are your preference, Tone Compressor can generate dark foreboding shadows with subtle noise free details. Version 4 has improved rendering of Tone Compressor and also added range of the sliders. Exposure Fusion is another operator but doesn’t work with the 32-bit file. It blends the exposures and outputs an image with a very natural look. I sometimes refer to the “single-shot look” of Exposure Fusion to see how extreme my tone mapped image looks. One of the obviously new features of v4.0 is the Preset Thumbnails Panel. It can be placed on the bottom or the right side of the tone mapping window. It not only allows you to click on a variety of built-in presets it also has a toggle to show all your saved presets. The built-in presets give you a nice flavor of what can be done to the original image. Your personal presets can have many variations, for example you might want to save presets for different lighting conditions. A night scene may benefit from desaturated shadows and a scene with a bright blue sky may benefit from greater highlight saturation. Tip: A good way to reveal your sensor dust is to click on the Grunge thumbnail. Version 4.0 also embeds the tone mapping settings in the processed image. Now you don’t have to worry about finding the settings file that belongs to the image, just click on “View Settings” from the main window and they appear. While you are tone mapping you’ll notice 3 tabs that expand for more adjustments. These adjustments can drive you bonkers so begin with the default setting. Experiment and play with them, try small and big changes but always watch how it effects all parts of your image. Keep in mind, a particular setting may work for one image and not at all for another. The yellow boxes below give you the nitty-gritty on each adjuster. Tip: When making slider adjustments keep an eye on the histogram window. You’ll notice which sliders add contrast, i.e. pixels spread left and right, which sliders move all pixels and which sliders lock down pixels while moving others. Here are the 3 tabs expanded for more adjustments. Just like most things in life the best way to become proficient at tone mapping is to practice, practice, practice. It helps to photograph a variety of scenes even at different times of day to learn the pitfalls of HDR tone mapping. Before you know it you’ll be viewing images that you’re proud of. Here’s a few of mine that I enjoyed creating. Skyline views from the world’s tallest residential tower in Australia make for nice city views but get close to the glass to avoid reflections. This is a straight out of Photomatix with no post processing. Down low in the Gazebo at National Catherdral in Washington DC with a fish eye, I had to take 7 images at 1EV spacing to capture the dynamic range of this image. This is straight out of Photomatix. This image taken in Bermuda required ghost repair of the beach swash (I used the -1EV image) and ghost repair of the splash in the distance. I also went through the aches and pains and manually used the rubber stamp tool to remove the chromatic aberrations in the rock face on the left. After Photomatix tone mapping I opened the image in Photoshop and increased the luminosity of the lighthouse light. I also brightened a few of the rock faces and darken others for more contrast. Black and White HDR can be very appealing just watch out for the same pitfalls like halos around objects that have a uniform sky as the background. Adding this model to the HDR image required a detailed plan on how to light her and the balloons. There is a strobe just camera left (note the reflection in the balloons), I had her walking on the edge of a picnic bench placed on a hill. I had to shoot her from a low angle so the hill was essential. I moved her from the original scene to the HDR scene. This is straight out of Photomatix except for some added leaves to cover hot spots and some dodging in the central part of the scene to give a subtle vignette. What I like is the small detail at the end of the road, a tire swing. This is straight out of Photomatix followed with a layer of texture over the entire image. Nothing too fancy but it adds to the painterly look. Here’s another with texture added. In this image I also added light to the street light by brightening it. This is one of those traveling carnivals that you had fun at but swear you’ll never let your children go to. It only takes a small commitment of time each day to become proficient at HDR tone mapping. As you explore the possibilities, your unique style will begin to emerge that portrays your vision. I know when you analyze your surroundings, use your camera to express, find your vision you will capture the full range life has to offer. HALOS – A halo is a fringe of brightness around an object that extends into a region of uniform tonality. Halos make you look like a rookie tone mapper and you don’t want that. You have two choices for controlling halos. First, control them while tone mapping or second, fix them in post processing. A building that extends into a blue sky is a good example where halos often develop. Lowering Strength is usually sufficient for controlling halos. However, the Highlights Smoothness slider in the Miscellaneous window is very useful for controlling halos in the bright regions of the image. If the bright region has halos eg. blue sky, then raising Highlights Smoothness will control them and even allow you to push the Strength slider to higher values. Here is a shot of the Lincoln Memorial with a blue sky. You can see the effects of Strength (S) and Smoothing (LS) in action and how blue skies are problematic. Watch how the halo around the tree increases when Strength is increased (right) and notice how Smoothing opens the shadows where the leaves are (down). Generally, Strength creates halos (right) and Light Smoothing create tone reversals (down). The image that is closest to a conventional single shot is top left. The most extreme is bottom right. If you do end up with a halo consider blending the tone mapped image with a single source image using layer/masks in Photoshop. Here is an image that has the blue sky from -2EV image blended with the tone mapped image. 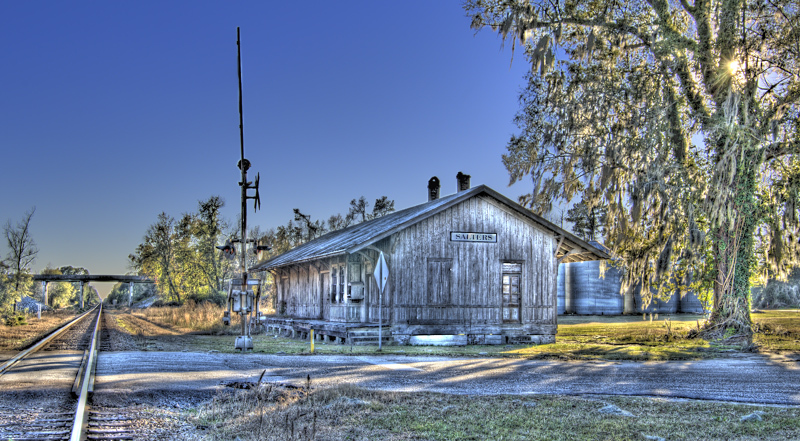 To review HDR post processing you can click the link under tutorials called Post-processing. Tone Reversals – Tone reversal are the result of taking regions of an image that we would normally perceive as darker than other areas and making them brighter. We all have visual perception that the sky is the brightest part and under the trees is darker. Notice the effect of tone reversals in the Lincoln Memorial (above) as you move through the thumbnails to the bottom right. The answer to correct tone reversals is raise the Smoothing followed by lowering the Strength. Noise is that set of brightly-colored randomly-spaced pixels in your image that is saved when you take the image. It’s a by-product of the camera electronics and it destroys details that cannot be recovered. Noise is mostly in the shadow area and it’s important to know tone mapping can enhance it. Lower the Luminosity slider – Be careful raising this slider above default, it’s cool because it raises shadow detail and add compression but it enhances noise if it’s there. Lower Strength to render the shadow are darker – remember increasing Strength moves the image toward tone reversals ie. brighter shadows. Default values with added Luminosity (+3) Noise is enhanced. Why the noise anyway??? Well I merged images that didn’t capture the full dynamic range, tisk tisk. Making the slider adjustments shown above I’ve suppressed the noise at the expense of local contrast. Notice how the smoothing functions lower the brick details but make the noise less obvious. Now there’s a good reason to capture the full dynamic range. Grain is caused by excessive local compression in the tone mapping process. It can obliterate details, just like noise, but details are recoverable by making the key adjustments that lower compression. Grain is most common in the dark portions of cloudy skies. Click on the area for a look at the 100% preview after each adjustment. Don’t adjust while in 100% preview. Grain – Try these controls and notice that they all effect compression. Grain high. Note – this is not noise. So now we have Tommy Toner who has great intentions but doesn’t quite have the tone mapping touch. He gets some of the image looking real nice but that sky is full of grain. Most would say he increased the strength to much, others might say he didn’t take enough images. Lower Luminosity and counter by raising Gamma (Tommy has them backwards). Lower Microcontrast and raise Micro-smoothing. Here is Tommy’s much improved image with the changes made. Wow, notice the noise is gone and the halos are barely visible but Tommy has given up some local contrast in the Memorial’s. What can be done about the loss of local contrast? Can I have my cake and eat it too: local contrast with little grain in the sky or clouds? Yes you can if you use post processing. Tommy cleverly saves both images, opens them in Photoshop and blends the grain-free sky with the image with nice local-contrast and posts it to Flickr and everyone makes it their favorite and sends him lots of awards and he’s famous. My goodness. I downloaded the trial software a month ago, and tried a few by bracketing raw files just to get started and they were nothing like yours, and other’s I have seen from “true” bracketing. I’ll go out and try a few shots to specifically try with the software, now that you’ve provided simpler instructions. I’ve very much wanted to produce some HDR photos, but got discouraged. Is there a possiblity that you comment on the new settings of version 2.5 ? I’d like to get started in HDR. Knowing that there are freewares like Qtpfsgui, do you clearly see the value of spending $99 (-15) in Photomatix ? Thnaks in advance. I’ve used 6 different programs for merging and tone mapping HDR images and have found that they are certainly not created equally. Each program will give a different HDR image result for the same scene (same image set). The differences are due to the way the algorithm merges to HDR (creating the 32-bit image) and the way the tone mapping compresses the image. Photomatix and FDRTools are programs that I use regularly because the results are excellent. I do think Dynamic Photo HDR also has a good program worth giving a try. Writing HDR software requires extensive tweaking and massaging to get good results. Most programmers of HDR-freeware are not willing to spend countless hours writing upgrades and fixes to generate an image that is par excellence. I have worked with Qtpfsgui and didn’t feel the results were nearly as good as the other programs that are available for purchase. That said, you can try them all for free and decide but I think you will find the results of the three programs mentioned above are worth it. Good Luck, Drop a note back and let us know what you decided. thanks for the best tutorial! Like your book, a very practical & useful piece of reading…. I now feel much better equipped to tackle Photomatrix. Finally found a site that explained how to actually make Photomatix work for me. Trial & error is OK but sometimes you can really spin your wheels trying to figure things out. I just downloaded 3.0 a couple of days ago and was looking for some direction. This will be a great help. I tried Essential HDR, but i didn’t really think much of it. It’s a simple and fast HDR app but it really seems like it just does tone mapping in the same way you would with using Levels and Edge detection. Where as i find Photomatix and Artizen HDR to really produce effects that to this day i can’t seem to reproduce using any of Photoshop’s none HDR filters such as Levels/Curves and Highlight and Shadows. I made on photoshop backgrounds for youtube, myspace and ect..
I`m so impressed by your website. Absolutely the best I´ve seen about HDR. The tutorial is easy to follow and very instructive. Must get your book as well. Will be coming back again and again and again. I just purchased your book only to find that the latest version of Photomatix is quite different, yet again with the latest update! Is there a chance you will update your tutorial again to cover this new look for Photomatix? Can you please go into more detail as to how the shot of the Salter’s railroad depot was generated? I absolutely love the look and feel of this shot, and as I am now retired, I’ve got nothing but time on my hands, and a lot of ideas that will translate to HDR very well. Certainly clears away some of the mystery with Photomatix, great tutorial, nicely written, concise, to the point, and the visual aids are superb. Getting started. Considering PS E7. Can you process HDR shots effectively in that program? Thanks…and love your book (and tutorial). I love the tutorial but I am confused by the Lincoln Memorial example. Thank you very very much! best Tutorial! Photomatix originally turned me onto and then off of HDR imagery… I was sick of that Halo effect. But I just wasn’t tweaking things enough. I finally went back and reworked something, similarly to this tutorial, and got great results. I think the most important point is that Photomatix does not necessarily have to be the catch all, you can take two Photomatix images and continue to improve them in Photoshop. This tutorial is fantastic and clear.A new world in the photo.the door is open for new ideas.. The program can make fantastic pics by some clicks. I have your book, and read it everynight. I have learned a lot, but have not purchased the software as yet. My question: Can you combine a tiff, jpeg, and a raw image to achieve the HDR result? Sounds silly I know, buy I was just wondering if that is possible? I have a difficult question here. Let’s say I’ve created a panorama in Photomatix Pro. I made my adjustments in Tone Mapping for the first image in the panorama and never changed those settings as I individually processed the remainder of the images that would make up my panorama. Later I discovered I had forgotten to add the final image to the panorama. Here is where the problem began…..
Just so everyone knows, Ferrell is a stand up guy…I emailed him asking if his 2008 book(Complete Guide to HDR Digital Photography)had an update to correspond to the later versions of Photomatix. Within minutes, he responded and pointed me to this update. All I can say is…thanks! This is the weirdest thing. This is hands down the best tutorial on Photomatix on the internet, and 0 comments !!! I have to bookmarked this page.I found this HDR tutorial very very interesting. I learned a lot. THis is best ever tutorial I have ever read. I found it after I heard HDR photography from some of my friends and google it to find more about it. I checked out several webistes with tutorials and I found some good ones too.. but this is best one not only for HDR but in general as well. I can not stop myself reading it. Downloaded trial version of Photomatix and started trying it out. I took three images outside of my house with snow on driveway. After processing, everything turn blue-ish and if try to tone it down sky and snow both toned down… couldn’t figure out to keep sky blue and make snow white-ish… still experimenting, but any tip will be helpful. The key to HDR i found is in three steps Shadows, Midtones and highlights.Having a scene with enough information on these three levels is what creates stunning images.Will be using this technique with my 3D camera to create 3D HDR .Exciting! Great tutorial! It would be a very useful addition if Lightroom plugin would be discussed. Using that is a real PITA, I have spent 2 long days for exporting a ton of files twice to Photomatix just to have all the output files lost – its either due to the low intuitive design of LR export(saving files are overcomplicated even without Photomatix) or a bug in integrating Photomatix. Sir excuse me please, what is your camera !? because im getting soon the Canon EOS 50D, but im not sure if that cam can take HQ photos like these ?! thank you very much =) ! Please advise. I am interesting HDR shooting. My question is how do I set my camera mode – A(Aperure-priority) mode or M(Manual) mode ? when I shoot BKT(bracketing). Just recently got into this and I love it. Your guides are superb and it’s definetly something that will enhance my work with time and practice, practice, practice. I have a simple, probably silly question to launch. I downloaded the trial version of photomatix and later on bought the original on disc. Do i need to uninstall the trial version before proceding with the disc instalation on my mac? … I’m a bit new on all this…. sorry ! and thank you for the answer to whoever does it! How do you remove, or export you finished image from Photomatix Pro 4.2? when the process is completed? I'm Ferrell McCollough and welcome to my blog. Photography is my sweet illness. It's the pursuit of capturing beauty and emotion, searching for lasting impression and seeing with new vision. Photography is a beautiful mix of the artistic and technical. My book is about the exciting techniques in HDR Photography. This link to AMAZON sells it for the best price I've seen. © 2019 Before The Coffee|ProPhoto Website by NetRivet, Inc.